Home » How to choose a locksmith? First of all, ask your friends, relatives or colleagues if they know a reputable locksmith located nearby. Their good/bad experiences will allow you making the right choice. Keep in mind that a personal recommendation is always more trustworthy than online reviews. However, if none of your contacts can advise a dependable professional, search for locksmith companies in the internet to learn their prices, services, working days and hours. Additionally, you can check the specialized forums, where customers share their views and give practical advices. Here you will find the reviews of the AZ Locksmith customers that clearly demonstrate quality services we provide. Always confirm the service price before the technician starts working! Let’s talk turkey – there are some companies that offer low-cost services starting (!) from a certain amount but once the job is done, a cheque with a higher price might be handed. The additional charges can be asked for the materials the locksmith used, or a different key/lock type needed, or long distances the technician had to travel to reach you. The AZ Locksmith offers transparent terms of service. We have fixed prices and don’t charge any extra fees, even at weekends, holidays or night hours. We introduce our flat prices at once. Caution would never go amiss! So, do not hesitate to ask for a business card and an invoice from the specialists, whom your home, car or business security is entrusted to. In turn, they should check for your identification before starting the work. A vehicle marked with the logo and the title of the firm adds trust to the company providing the locksmith services. As closer the locksmith service is to you, as faster your problem will be solved. Do check the location of the company and its branches to save time and money, since far located locksmiths may charge you more. AZ Locksmith is able to provide with mobile services all over London and nearby areas. Our specialist riding fully equipped vans will do any job right on-site. So, you can get a service shortly after calling us. This is the last but not the least point to take into consideration. A dependable security specialist should have a license and an insurance. 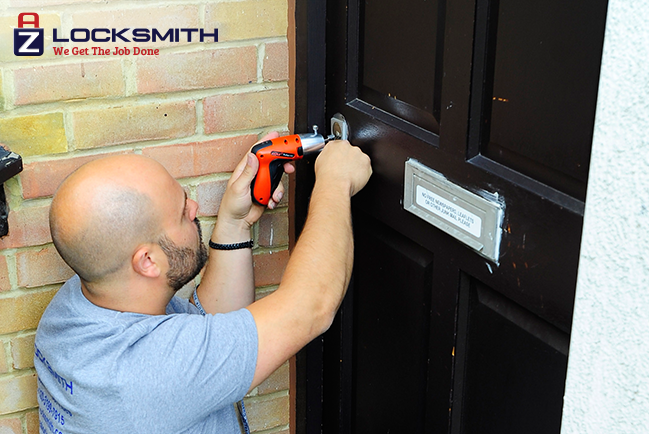 Make sure your locksmiths has a minimum of 3-5 years of experience and training in this field, otherwise he/she might damage your property.